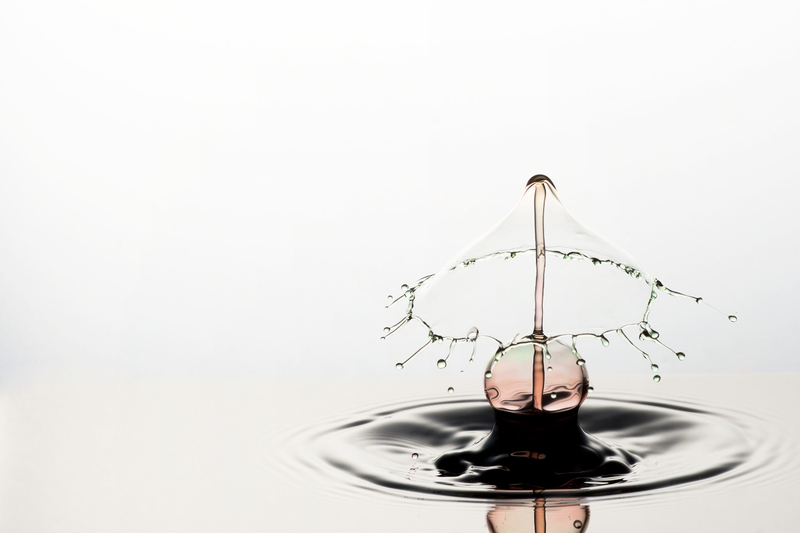 For a while I was really into water drop photography. There are opposing dynamics with this type of work though which makes it both rewarding and extremely frustrating. To become good at creating these shapes there is a lot of technical stuff happening. Some of those are the equipment, the liquid you’re using, any additives you might put in to change the surface tension and viscosity, the height of the drop, the timing between multiple drops, the angle of the camera and… I think you get the point. A lot of things to consider. But when you get it all right, the feeling is well worth the effort. The frustrating part is that because you are working with a liquid there is an element of random chance. You may get everything right but maybe the drop picked up a little extra liquid leftover from the previous one making it just that much larger and changing the resulting shape. Here is one of the ones I’m pretty proud of. I have seen others produce this shape, very well I might add, but I hadn’t actually intended to do this yet. I was working on some taller columns when I had changed my settings a bit further than normal and all of a sudden, I started getting this bubble that formed around the existing column. Add to that, another drop coming down to collide with the column and you get a nice “shade”. There’s that chance I was talking about. I love it when I get lucky! I was also working on getting a seamless transition from the dish to the backdrop as Leon Dafonte does so well. I think this one is somewhat close but the horizon line is still slightly visible. I’m getting close to it though and I think with a bit more fiddling I might just get it. I decided to position the “Lamp” on the righthand side of the frame as I thought it would be a bit more interesting. What do you think? Does the partial reflection distract from the image? Oops! I wrote it in notepad, but sent it to a wrong location. Yes, I was referring to ‘Liquid Lamp’. About it being great and how much I like it.